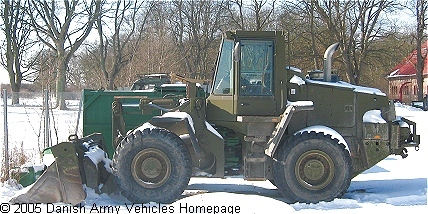 Danish Army Specific: The Case 913 wheeled loader is a rare bird indeed. A single unit was bought to replace a Caterpillar 950 that was lost in the former Yugoslavia in the early 1990´s. The reason for choosing the Case, was the possibility to join an order placed by the British Army. The Case was attached to the Zealand Engineering Regiment for more than 10 years, and when the regiment was closed, the loader was transferred to Jaegerspris Shooting Range. Length: 6.89 m (269 inches). Height: 3.25 m (127 inches). Weight: 13.104 kg (28.829 lb.). Engine: Own 6-cylinder, type 6T-830, 8.269 cm3 (504 cubic inches), liquid cooled. Horsepower: 140 at 2.100 rpm. Transmission: 4-speed ZF, type 4WG 180 with torque converter. Tyres: 20.5 x 25 XGLA. Fuel capacity: 235 liter (52 gallons). Additional: A 10 ton capacity Sepson winch is mounted at the rear. Top speed is 36 km/h.